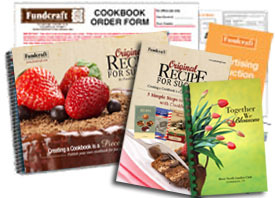 The Information Kit contains Fundcraft's easy to read catalog that shows you Step-by-Step how to put your cookbook together and a sample cookbook. Your Web ID & password is also included so you can login and take advantage of the Web Features we provide. Download the FREE Info Kit or order it by following the instructions below. [ Print the Order Form ] and mail or fax it to us. Where did you hear about the Fundcraft Fundraising Plan?